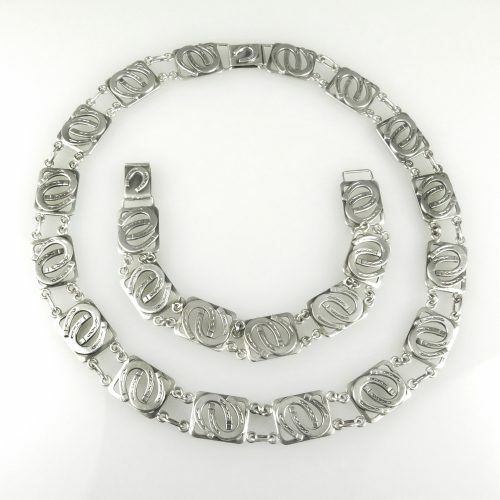 Style/Date: Mid Century 1950's Materials: 830 Silver Description: Danish silversmith Neils Erik From designed this matching set of double horseshoes linked bracelet and necklace. They could be worn separately or together, or made into one longer necklace. 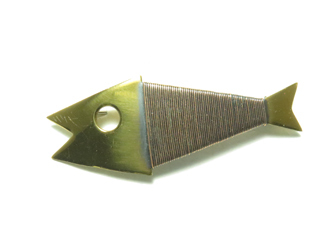 Style/Date: 1960's Materials: Brass and copper wire Description: Whimsical handcrafted fish pin made by Robert Hogan and Elizabeth Bolas, the original owners, who were both Rhode Island School of Design students together. 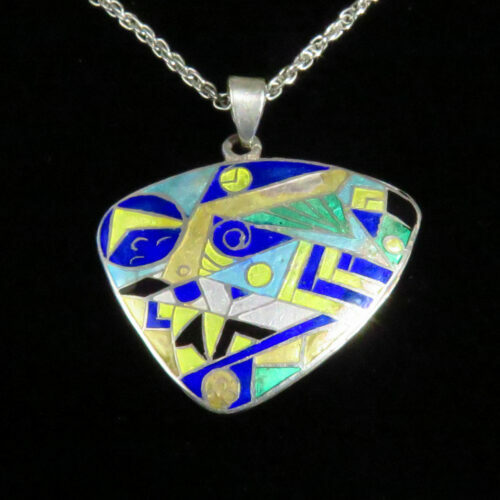 Style/Date: Mid-Century modern Materials: Sterling silver and enamel Description: Hand made free form shaped multi color enamel pendant. Comes on a 24" sterling silver rope chain. 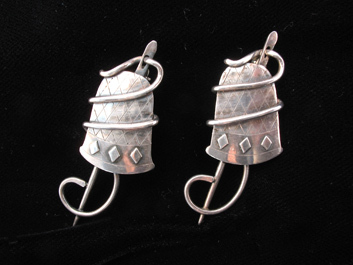 Style/Date: Studio - 1950's Materials: Sterling silver Description: Whimsical handmade pair of pins with thimbles, thread and needles. 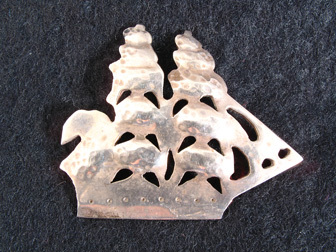 Style/Date: Late 1940's Materials: Sterling silver Description: Die-stamped sailing ship pin considered his trademark. Franklin Porter's originals were hand made. 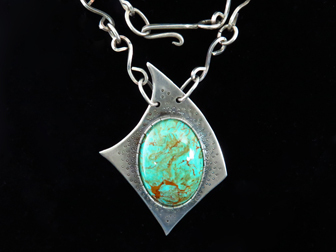 Style/Date: 1950's Materials: Sterling silver and turquoise Description: Flame in the wind sterling modernist pendant with large oval turquoise with a handmade square wire link chain. 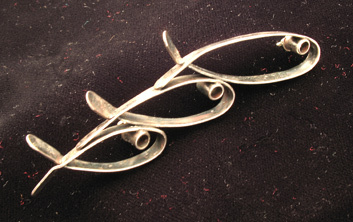 Style/Date: 1950's Materials: Sterling silver Description: Whimsical hand made studio fish pin with large flat silver wire.